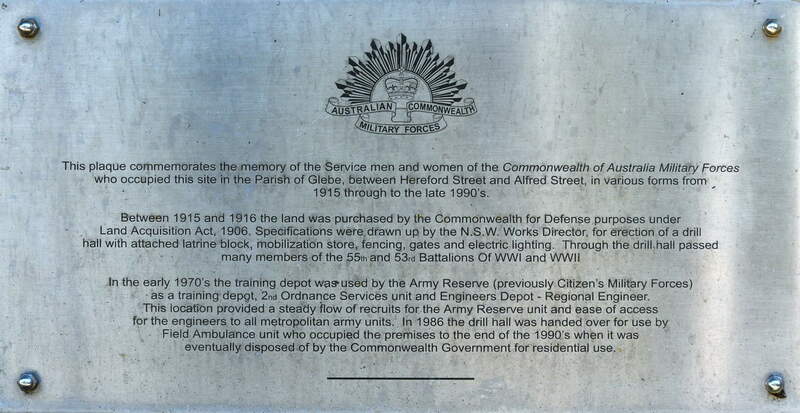 This plaque commemorates the memory of the Services men and women of the Commonwealth of Australia Military Forces who occupied this site in the Parish of Glebe, between Hereford Street and Alfred Street, in various forms for 1915 through to the late 1990s. Between 1915 and 1916 the land was purchased by the Commonwealth for Defence purposes under Land Acquisition Act 1906. Specifications were drawn up by the N.S.W Works Director, for erection of – drill hall with attached Latrine block, ???? store, fencing, gates and electrical lighting. Through the drill hall passed many members of the 55th and 53rd Battalions of WW1.